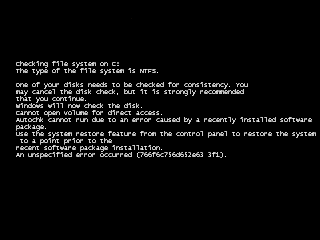 Windows 2008 R2 is reporting NTFS file system corruption that requires a chkdsk. Use system restore feature from the control panel to restore the system to a point prior to the recent software package installation. An unspecified error occurred (766f6C756d652e63 3f1). I suspect the antivirus software was denying disk access, but I did not want to uninstall anything. 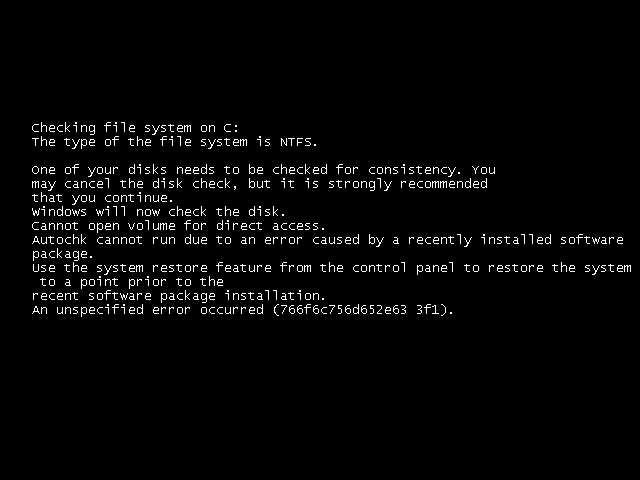 chkdsk runs for a while and repairs some stuff. I reboot back into windows, the drive is OK and the file system errors are gone.